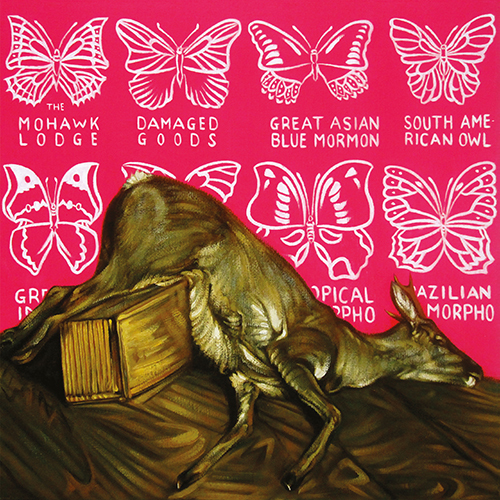 Today White Whale Records releases Damaged Goods, the fourth album from the Canadian indie rock group The Mohawk Lodge, fronted by Ryder Havdale. The album release accompanies an already in-progress nationwide tour across the US that includes 30 plus dates, part of over 150 shows the group will play this year. Currently playing shows on the West Coast, the group will embark on an ambitious trek through the southern US before playing shows all along the East Coast and returning to Canada. At just 30 minutes, every second of the new album Damaged Goods is packed with substance, making it Havdale’s most urgent and powerful work to date. Inspired by the band’s experiences touring through Europe promoting their third record,Crimes (2010), Havdale sought to capture the intensity and chemistry of their live performances on the next project. Recorded live off the floor with minimal equipment in the midst of a Toronto heatwave, the album breezes by, grabbing the listener with catchy melodies, driving instrumentation and Havdale’s deep, affecting and often haunting vocals. Never one to shy away from emotional content, the album explores the joyous, thrilling highs and punishing, sorrowful lows of a life on the road creating art, and takes the listener along for the ride.